My friend and gaming buddy Berkeley John (you Bay Area folk may remember him from our two recent tourneys) has just taken the plunge into customs. Let this serve as an advance warning. 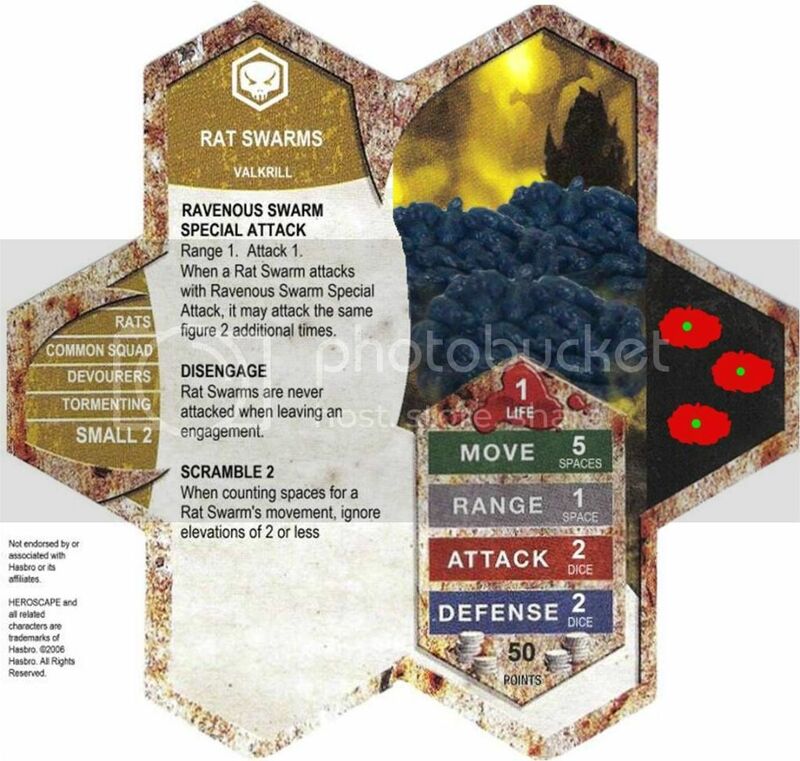 With endless thanks to Lamaclown, here is a corrected card for Tiranx's nomination of my Rat Swarms. Looks good to me, Killometer. Yea to reviewing the boss' Rat Swarm. Fun unit. Can I ask one question: My memory (which is old and broken, I'll admit) is that these guys are a very small/short sculpt. How did you decide on a height of 2 for them? Is it more a practical thing, for the sake of engagment (i.e. so that someone with height on them can still attack them) and the like? Or are they really taller than I remember? The sculpt is absurdly small, Mmirg. It is roughly as thick as four quarters stacked on top of each other. It's the mini from Castle Ravenloft, which I suppose you do not own. Yes, I do have Ravenloft, which is why I was wondering why the height was 2 (but my memory is bad, so I thought maybe the sculpt was thicker than I remembered). If they are that short, then is the height just there to allow melee to fight them in uneven territory, i.e., if you have height you suddenly can't reach them. So it's a mechanics thing? Or is there some other reason to make them height 2? As I recall Killometer discussed it elsewhere & said it was just too impractical to have them running around at height 1. Yes, making them height 2 was an intentionally made mechanical decision to allow them to attack/be attacked by a figure with a height elevation. Hah! That would be interesting. Never realized what height 1 would mean for a figure. I haven't been following the thread, but does it look like anything will be approved before Memorial Day weekend?